If you haven't heard already . . . Many years in the making, County Executive Ike Leggett has announced that Montgomery County's forged an arrangement with music promoter Live Nation to run a Fillmore music hall on Colesville Road. Once a former J.C. Penney department store, the fully-built venue will be donated by the Lee Development Group, which in turn will receive extra accommodations to build a mixed-use project on their property behind the hall. If you're curious about the long history behind this project, click here to see every single JUTP post about the Fillmore over the past three years. 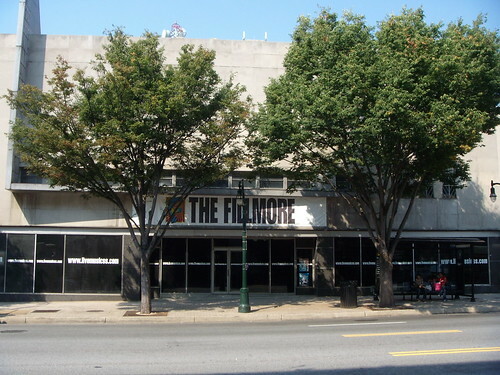 Montgomery County and the Lee Development Group today signed a final agreement permitting the construction of a Fillmore Music Hall on the property which formerly housed the J.C. Penney Company in downtown Silver Spring. After completion of the Music Hall, Lee Development Group will donate the land to the County. Under the terms of the agreement, Montgomery County receives the $3.5 million property at no cost to create a dynamic new music, entertainment, and community use venue in downtown Silver Spring, a move that will bolster economic development and the music scene for that community and the County as a whole. The new music hall, to be run under contract by Live Nation, will preserve the historic façade of the old J.C. Penney store site on Colesville Road owned by the Lee Development Group – a site vacant for 18 years -- and build a modern, new music and community use venue behind it. The State of Maryland and Montgomery County will contribute $4 million each – for a total $8 million in public investment -- toward the cost of building the facility, which will be owned by the County. The Music Hall requires no ongoing public subsidy. An economic impact analysis done by the County’s Department of Finance shows an annual cost to the State and County on projected bond issues as approximately $355,000 and annual direct and indirect income to the State and County from sales, income, beverage, fuel, and other taxes, as well as rent, as approximately $1,067,000. This results in a net annual profit to the public of $712,000. When the value of Live Nation’s improvements to the County-owned building and Live Nation’s ongoing and structural maintenance work are included – as well as the value of community use and Live Nation community contributions – the net benefit to the public increases by another $951,000 to a total net public benefit annually of about $1,663,000. Under the terms of the agreement, the Lee Development Group would also provide for free management services for the construction of the facility, a $500,000 value. The land donation is intended to serve as the required “public use space and public amenity” that is required for County development projects. Almost always such an amenity is provided in conjunction with a development project. In this case, however, the Lee Development Group is providing the amenity up-front – long before they have a development project on the property adjoining the former J.C. Penney site. “The County’s vision is to bring a dynamic, first-class music, entertainment, and community use venue that will offer a wide range of musical choices to Silver Spring at the former J.C. Penney site,” said County Executive Ike Leggett. “That’s why the County approached the Lee Development Group with this innovative approach, asking them to donate this key property at the gateway to Silver Spring. “We want to bring Silver Spring revitalization across Colesville Road and Georgia Avenue. We want more customers for Silver Spring businesses and restaurants. This location will create a dynamic center of music and entertainment with the American Film Institute and the restored Silver Theater directly across the street. ”This complex and groundbreaking agreement is finally signed. Now we look forward to working with the County Planning Department to move this project forward,” said Bruce H. Lee, President of Lee Development Group. Finally! (Kind of wondering if 9:30 Club owner Seth Hurwitz could have built and opened his competing music hall in the time this took to happen.) Here's hoping we'll see music in Downtown Silver Spring soon enough. 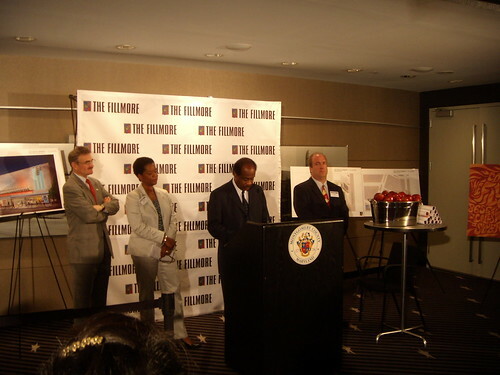 A young, strapping Ike Leggett signing a non-binding agreement with music promoter Live Nation to open a club on Colesville Road in September 2007. 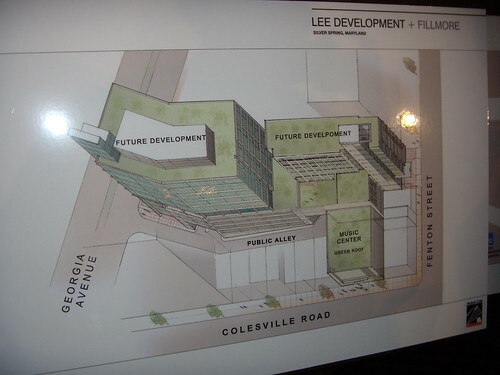 An early plan of Lee Development's mixed-use project behind the Fillmore. Giving the developers the the approval to build a project in which nobody knows what that project is going to be is just a bad idea. Do people really not know what a developer will build there? Ok, I'll break the suspense. Look at the photo in this post. It'll be a big building like any other in Silver Spring. Who cares if it's an apartment, office, or whatever. It won't be an obnoxious use because zoning prohibits it. Just bring the music already.